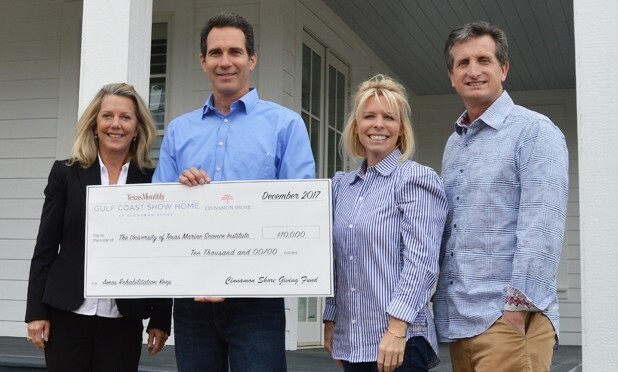 Sea Oats Group, developers of Cinnamon Shore, announced yesterday it has donated $10,000 to The University of Texas Marine Science Institute in Port Aransas through its partnership with Texas Monthly for the 2017 Gulf Coast Show Home, which was open to the general public for tours throughout the Summer of 2017 with a percentage of proceeds from ticket sales benefiting the local Marine Science Institute. The donation will directly benefit the Amos Rehabilitation Keep (ARK) at The University of Texas Marine Science Institute in Port Aransas. The ARK rehabilitates injured shorebirds and sea turtles found on our local beaches and bays. “We are committed to preserving and protecting the Texas Coast and its inhabitants and intend to continue to do our part,” said Lamkin. “When the proposal of a show home was first pitched, I knew just the worthy organization that it could benefit. The Amos Rehabilitation Keep at UTMSI has a special place in the heart of many Texans and Texas Monthly is proud to help support it,” said David Dunham, Texas Monthly Vice-President of Development. The Amos Rehabilitation Keep (ARK) was not immune from damages inflicted by Hurricane Harvey and the donation comes at an opportune time. Like other buildings on the campus and in the community, facilities at the ARK were severely damaged from Hurricane Harvey. Over the last few months university staff worked with several contractors and support from volunteers to renovate the rehabilitation infrastructure. Just last week, staff at the ARK worked tirelessly to rehabilitate and release hundreds of sea turtles that were cold stunned from freezing temperatures. More than forty members from the local community volunteered to host the show home throughout the summer. The home has been sold, but information on all of the materials, furnishings and fixtures is available at the Cinnamon Shore real-estate office. The Amos Rehabilitation Keep will use the funds to continue to collect, rehabilitate and release injured marine wildlife.